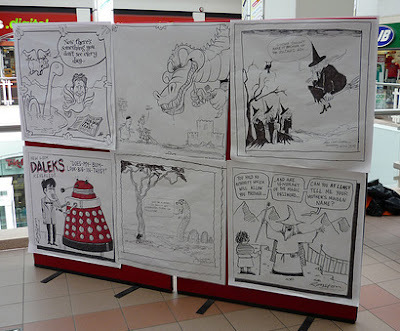 I've finally recovered from the exertions of the Shrewsbury Cartoon Festival, so here's a picture-based report on my personal experiences of the event. For a fuller report, see the stuff we posted at The Bloghorn over the weekend. 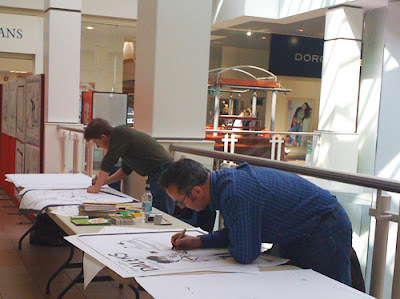 Above: this is me working on my Daleks "HuMural", as seen in the previous post. I'm going to draw a smaller version for a 10-year-old boy from Shropshire who wanted to take this home with him! The HuMurals, all drawn in cartoon frames, were put on large boards and displayed in the Darwin Shopping Centre. "I had a word with the RSPCA about my cramped working conditions." 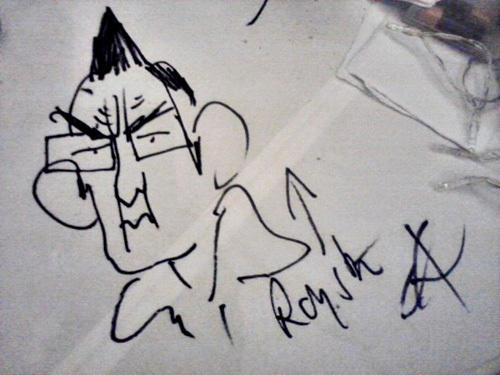 I took part in "reverse caricaturing" for the first time this year. 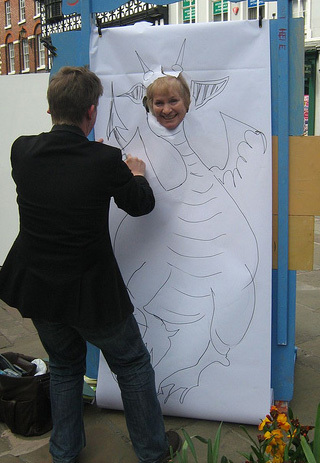 Here's a picture I took of my colleague Matt Buck drawing festival patron Libby Purves as a dragon (well, it was St George's Day on Friday). Working on reverse caricaturing, I was well and truly out of my comfort zone. I did it for more than an hour and there was a constant stream of children, all with a good idea of who they wanted to be: Spider-Man, Doctor Who, Cleopatra, er, "a soldier in a war" ... you name it. It was very tiring but a good experience. You soon learn that you're unlikely to produce a masterpiece, but it doesn't matter. 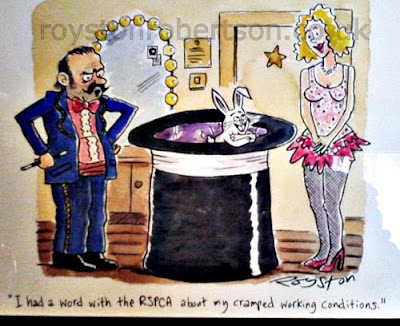 It's the performance of drawing that people like to see, and if you can throw in a few jokes, using props, speech bubbles, etc, you get away with it. 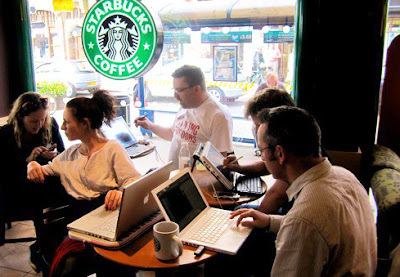 No report on the festival would be complete without a picture of us in Starbucks working on The Bloghorn. Fuelled by very strong coffee we produced a steady stream of blog posts, pictures, Tweets and video. All work and no play would be very dull of course, so there was the usual amount of eating, drinking and general merry-making. 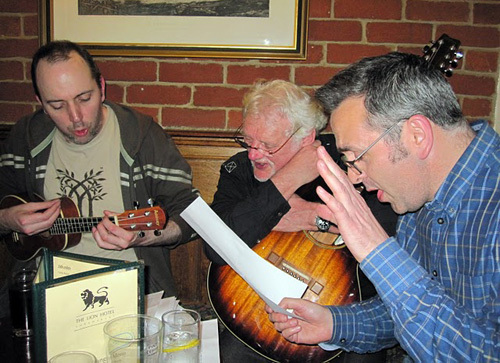 Here's me singing, accompanied by Tim Harries on ukulele. Judging by my "talk to the hand" gesture, not to mention the bemused look on Noel Ford's face, this was when we performed our unique version of Half Man Half Biscuit's Joy Division Oven Gloves on the Friday night. You had to be there. And finally, no Shrewsbury Festival is complete without the compulsory drawing on paper tablecloths after the Saturday night meal. This is me as seen by political cartoonist, and my former Eggheads team-mate, Martin Rowson. "Why has he drawn you so angry?" said everyone. "What's with the ears?" said I. Another vintage year at Shrewsbury, then. Looking forward to 2011 already. You can see more Shrewsbury pictures than the human brain can cope with over at the Bloghorn's Flickr group. Thanks to Jason Chatfield, Jenny Henrywood, Alex Hughes and Gerard Whyman for additional pictures used here. Wow! Looks like a grand time! Must spoil you for every day life afterward ... ! 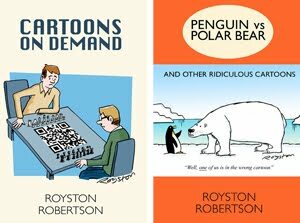 Ha, yes it does take a bit of adjusting back to the normal solitary life of the cartoonist! An enjoyable read and some great pics... it was indeed a grand time as Mike suggested! And dreamy - what's that? Yes OK, I'll head over to the HuMurals straight away ..."